As the final hammer fell in the Contemporary Art Evening Auction at Sotheby’s last week, history was made: it marked the first time a piece of live performance art had been sold at auction. As the packed saleroom looked on, the final lot of the sale — Banksy’s Girl with Balloon — was in the midst of an intense bidding battle from buyers in the room and on the phones, but what was to follow has dominated headlines the world over, taking the art world by storm and prompting speculation and debate. Seconds after the hammer fell, part of the canvas passed through a hidden shredder, and in the process of ‘destroying’ the artwork, a new one was created. 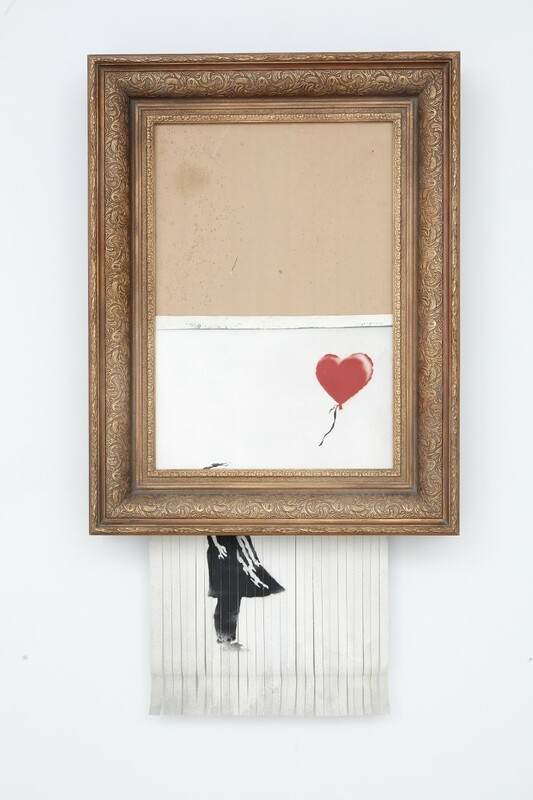 In a 2017 poll of UK arts writers to discover the nation’s favourite art work, Banksy’s Balloon Girlcame out at number one. The painting was housed in an ‘artist’s frame’, a large, heavy, Victorian-style frame of the kind often used by Banksy to poke fun at the establishment. He has previously pulled stunts in the some of the world’s most respected museums and galleries such as the Louvre, Tate Britain, the British Museum, the Museum of Modern Art, the Metropolitan Museum of Art, covertly hanging his own works alongside the permanent collection. In many cases, it took some time for these subversive interventions to be detected. In doing so, and in this latest action at Sotheby’s, Banksy has cleverly nestled himself in the pages of art history.